Witnesses told Nevada Highway Patrol that a Buick SUV attempted a U-turn before going south in the northbound lane and colliding head-on with a Ford Ranger. Two people have died in the first fatal crash on Interstate 11. 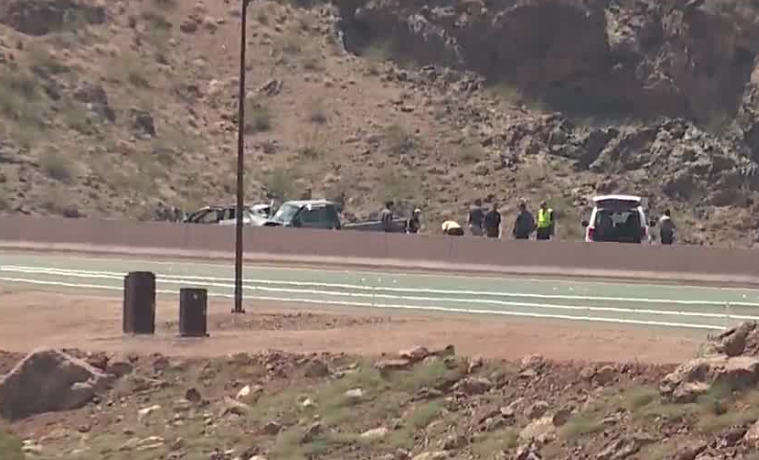 The crash was reported around 9:43 a.m. Tuesday on northbound Interstate 11, just before the junction with U.S. 93 near the Hoover Dam Lodge. Witnesses told Nevada Highway Patrol that a Buick SUV attempted a U-turn before going south in the northbound lane and colliding head-on with a Ford Ranger. NHP reported that both vehicles steered their vehicles toward the inside shoulder to avoid a collision but then the Buick hit the front of Ford. Both vehicles then hit a concrete median barrier wall after the crash. The passenger of the Buick was pronounced deceased on scene while the driver was taken to Sunrise Hospital and later pronounced dead. They were identified as 63-year-old Christopher S. Levo and 64-year-old Steve Mindy, both of Milford, Ohio. Both Ford passengers were taken to St. Rose Dominican, Siena Campus for treatment. Their conditions are unknown at this time. Northbound Interstate 11 reopened to traffic around 4 p.m. Tuesday.